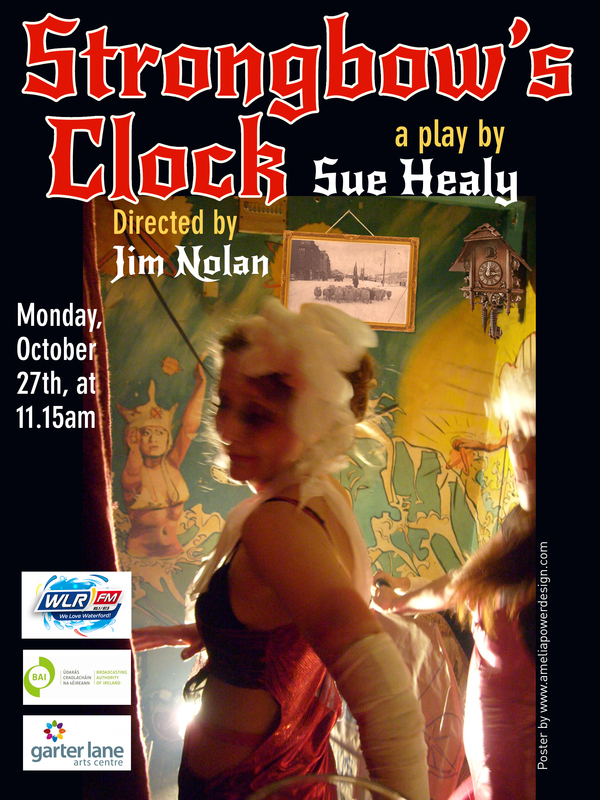 Strongbow’s Clock podcast on WLRfm (broadcast Oct. 27th). Set in Brennan’s Bar, a peculiar pub on Waterford’s O’Connell street, Strongbow’s Clock is a comic ghost story concerning a pair of barflies, an immigrant Hungarian barman and the events that ensue when the pub’s clock stops working and a mysterious young woman is swept in the pub door. Strongbow’s Clock is a comic ghost story. It is also a study of the consequences when unrequited love is toyed with carelessly, and the violence such passions can stir. Strongbow’s Clock is directed by acclaimed playwright Jim Nolan and stars leading Irish talent Michael Power, Jenni Ledwell, Ema Lemon and Nick Kavanagh. Strongbow’s Clock was my fourth radio drama and followed Cow, The Daffodil and Cake, also directed by Jim Nolan. My radio work since includes: The Angel of Trafadden, Shellakybooky, The Cat in the Box and Mussels. Strongbow’s Clock was made with the support of the Broadcasting Authority of Ireland with the television license fee. This entry was posted on Friday, May 27th, 2016 at 10:04	and tagged with ema lemon, eugene sully, ghost story, jenni ledwell, Jim Nolan, Michael Power, nicholas kavanagh, radio drama, Strongbow's Clock, sue healy and posted in Uncategorized. You can follow any responses to this entry through the RSS 2.0 feed. well introduced, great details, strong combination with the image! how marvellous! another play, only a few days after ‘Cake’. I hope it will be very successful and be much appreciated.